The real and reel deal meet for the first time. If you ever wondered what would happen if Facebook’s billionaire founder Mark Zuckerberg met Jesse Eisenberg, the actor who portrayed him in the hit movie The Social Network, this is it. 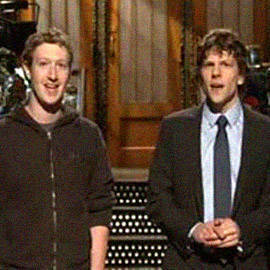 The Oscar nominee hosted Saturday Night Live last week where he came face to face with Zuckerberg for the first time. During Eisenberg’s monologue, SNL’s Andy Samberg took a shot at impersonating the Facebook founder, and minutes later, the real Zuckerberg joined the two of them in an awkward moment ("Awk-berg!") onstage. When asked what Zuckerberg thought of the "Facebook movie," he said, "it was interesting."